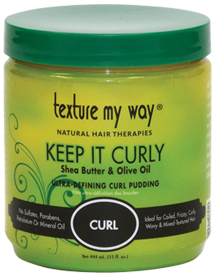 Finally, you can enjoy a curl pudding that’s light-weight, smells great and won’t flake or cake-up on hair & scalp! Gives amazing definition to curls, waves, coils, twists, braid-outs and afro puffs, so that you can enjoy a soft, frizz-free, care-free look that lasts. You define your curl pattern! Use a little to elongate loose waves, coils and curls or more for super scrunchy, tighter styles. AQUA (WATER), PROPYLENE GLYCOL, PPG-1 TRIDECETH-6, BUTYROSPERMUM PARKII (SHEA BUTTER) FRUIT, GLYCERIN, GLYCINE SOJA (SOYBEAN) OIL, OLVEA EUROPAEA (OLIVE) FRUIT OIL, DAUCUS CAROTA SATIVA (CARROT) SEED OIL, POLYQUATERNIUM-37, PROPYLENE GLYCOL DICAPRYLATE/DICAPRATE, CETYL ALCOHOL, DIMETHCIONE, PARFUM (FRAGRANCE), d-LIMONENE, LANOLIN OIL, ACRYLAMIDOPROPYLTRIMONIUM CHLORDIE/ACRYLAMIDE COPOLYMER, STEARALKONIUM CHLORIDE, BENZYL BENZOLATE, LINALOOL, 5-CHLORO-2-METHYL-4-ISOTHIAZOLIN-3-ONE, 2-METHYL-4-ISOTHIAZOLIN-3-ONE, HYDROLYZED QUINOA, YELLOW 5, BLUE 1, RED 40.